Security and privacy are a hot topic right now. You’ve probably seen clips of Mark Zuckerberg’s testimony to Congress or received countless emails informing you of updates to Privacy Policies and Terms of Service. The security landscape of the Internet is changing for the better. New data protection laws are helping all of our data be handled with more care. The security and validity of your data and the customer data you enter into iClassPro is immensely important to us. That’s why we’re excited to share new updates to policy management that clarify policies and enhance security. These updates will give you and your customers more control over policies and agreements. Previously you had the ability to create a single policy with three sections: “General Waiver”, “Billing Authorization”, and “Rules, Terms, and Conditions”. These policies were only allowed to be “blanket accepted” per family. We’ve improved this to now allow you the ability to create as many or as few policies as you need in your facility and these policies can be accepted on a per-student basis. This change allows your business to capture individualized consent. Additionally, iClassPro keeps a history of which policies have been accepted, who (by email address) accepted it, and when it was accepted. A full history of agreement status for the student can be found under the student’s record by clicking on the new Policies tab. Parents/guardians now have the ability to revoke their acceptance of certain policies at any time (you will be alerted to this in the Staff Portal with a message: “Student doesn’t have a required policy accepted”). As part of this update, we’ve created a specific policy based on feedback from you and new privacy regulations. 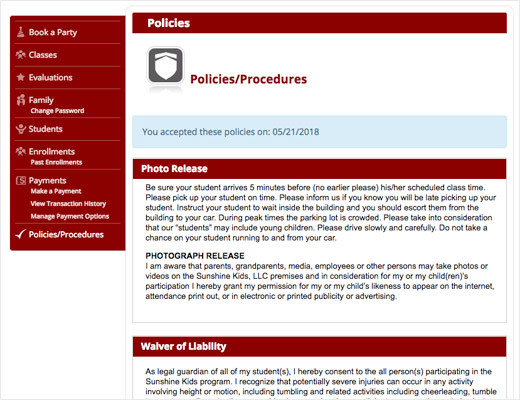 If you choose to utilize it, the new Photo Waiver policy is a separate consent agreement allowing for the addition of student photos to iClassPro. Students that do not have this policy accepted will not be able to have a photo added to their record. If you choose to, you can enable the Photo Waiver policy. You will also need to make it active before changes take effect. Note: making this policy active will temporarily hide any existing photos until a parent’s consent is recorded. If they consent, the photo will become visible again. If they remove consent, the photo will be deleted (and cannot be recovered).